As someone with a limited knowledge of folk music, The Bollands definitely left an impression with their energetic vibe. Their new music video of Stalker, a single from their 2014 album Paper Houses has both a playful song and video that got me bobbing and moving around. I guess that’s what The Bollands is about: getting the listener dancing and moving with their self-described ‘foot-stomping’ goodness. And they do well in doing this, as every upbeat song from Paper Houses has gotten me dancing in my chair. Aside from their contagiously happy rhythms, the fullness of the duo, Christian and Joyce’s voices further bring about jolly folk vibes. Christian’s voice is reminiscent of Matt Corby’s, being slightly raspy but at the same time quite booming, which seems to fit the duo’s folk style completely. The album begins with Inside, which has an amazingly impressionable introduction, starting with a grand, ascending buildup that ‘drops’ into thick piano chords played in staccato, which really helps in giving the song it’s ‘stompy’ feel. This is a recurring theme within the album, and I’m tempted to say it’s what gives The Bollands their unique dance-inducing folk sound. Whether it is in the piano playing, drums, or bass, the use of this staccato-style accenting of the downbeat really adds another element to the existing folk sounds in this album. 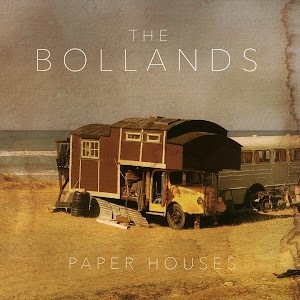 While there are some recurring elements, The Bollands have clearly been experimenting with Paper Houses, through unique rhythms and instrumentation, which can be seen in their list of artists on the underside of their album cover, featuring a wide variety of other musicians which I thought was great. You can also hear the new instrument’s contribution to their songs; Stalker clearly uses an upright bass that gives the song its great stringy vibe (along with the banjo too! ), while The Preacher’s Organ has it’s unique feeling through the droning harmonium in the background. Another minor but very well-done aspect of some of their songs is the use of background singing, which I feel does very well in adding to the folksiness of their music. Whilst The Bolland’s use of a varied instrumentation in this album has definitely worked, I’m not sure how I feel about their often-sudden rhythmic changes. Don’t get me wrong, I love the variety of rhythms in this album, especially in Light of Day, which features an amazing use of the hi-hat from the drummer in a 3/4 timed chorus. The ending of Inside also switches from their usual foot-stomping, piano mashing rhythm to a rolling indie-rock style folk ending, which I found very enjoyable and added a whole other element to their music. However there are moments where their sudden rhythmic changes seem out of place, like in Room For You, which features two great parts, where one is an energetic marching rhythm that awkwardly breaks into a slow ballad style part. At times, it feels like The Bollands become bored with their existing musical motifs and just try to move on to another within the same song. Their ideas are great, but I feel the album could have expanded more on the great folk themes, rather than create variations of the same marching rhythm that relies heavily on repeating thick piano chords in staccato. Overall, Paper Houses is a great energetic folk album with some indie-rock influences. If you enjoy bands like Noah and Whales, Maps and Atlases, or Matt Corby, then you will definitely find The Bollands enjoyable. They have their own merrier and playful take on folk tunes, which is fresh and easy to listen to.